Here are some ideas to help you plan a rock garden to decorate your landscape! Rock gardens are small plots designed to feature and emphasize a variety of rocks, stones, and boulders with plants filling in the spaces and concealing the joints between stones. Some homeowners may choose to design a rock garden to exploit a rocky area in their yard, while others may introduce rocks to an otherwise flat and rockless area. Rocks can even be used to create a raised bed in your landscape. Plants that do well in rock gardens are small and compact and tend to be tough and drought-resistant. 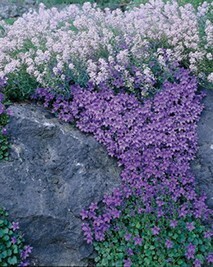 Many plants ideal for a rock garden flower profusely in a range of colors. Here are some ideas for starting your own rock garden! Select rocks that will provide color to your garden in addition to the plants, such as red sandstone or black lava rocks. I will use the red sandstone as an example. We want to choose plants that work well with the red sandstone, so we will choose from some plants with hints of red as well as silver, yellow, and white. It is advisable to determine the layout of your rocks before you start planting, placing heavier rocks first and smallest rocks last. For example, for a raised bed I may use large stones to create the circular base, fill that in with soil, and then add the smaller stones in a second layer above. When choosing the plants, I want to consider growing requirements as well as color. I want plants that prefer good drainage, as my raised bed will encourage good drainage. If my rock garden is in full sun, then I also want to choose plants that do well in full sun. I also want to look for some variation in plant height and leaf texture. Plants that I might choose for my red sandstone rock garden are as follows: Limelight Sedum for a short plant with yellow-green foliage, Ascot Rainbow Spurge will provide yellow and red foliage with cream-colored flowers (as a taller plant, it will also give my garden some depth), Sempervivum Red Beauty can provide more low-growing red foliage, Helen Von Stein Lamb’s Ear adds additional contrast with silver foliage, and Snowcone Candytuft provides me striking white flowers. 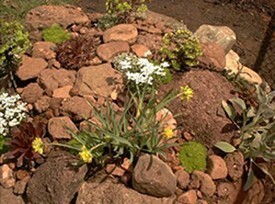 Daffodil bulbs can also be planted within the rocks to add early spring color. Avoid choosing too many different types of plants which may detract from an overall unified appearance. Repetition of the same plant type can help promote unity, so choose two or three different plants of a few select varieties. As you plant, add additional smaller rocks to nestle in between your plants. Eventually, you want as much surface as possible covered with plants and rocks. You can even use small pebbles as mulch to help suppress weed growth. Find a pebble that matches your main stone in color. Sit back and enjoy your rock garden as it changes with the seasons. English rock gardens, pioneered by Reginald Farrer, are based on the idea of creating naturalistic looking gardens with rugged stones aligned to mimic natural rock outcroppings. The rocks are like “icebergs” with only a portion of them visible above the ground. The cracks and crevices in between the rocks are filled with profusely blooming plants. To create this type of garden, you will want to use partially buried rocks. Add soil to fill in the gaps between layers and rocks and place your plants in these areas. The traditional English rock garden uses alpine plants that prefer low moisture and cooler temperatures. Some taller plants that will look good in an English rock garden include the Serious Black Clematis, the Canary Island Foxglove, and Heatwave Blast Sage. But the true charm of a rock garden is the plants that grow only a few inches high, but spread out to carpet a large area. Plants that I might choose for my English Rock Garden include: Ajuga Blueberry Muffin Bugleweed, Georgia Blue Speedwell, Blue Spruce Stonecrop, Elfin Creeping Thyme, Firewitch Dianthus, Sunset Hen and Chicks, and Purple Beauty Creeping Phlox. As before, choose plants with similar growing characteristics and limit your garden to multiple plantings of a few select varieties. Once your English rock garden is complete, give it a few seasons to allow the plants to take hold and spread beautiful colored carpets over your landscape. Nikki Sawyer - Dr. Nikki T. Sawyer is a biologist who also loves to garden!